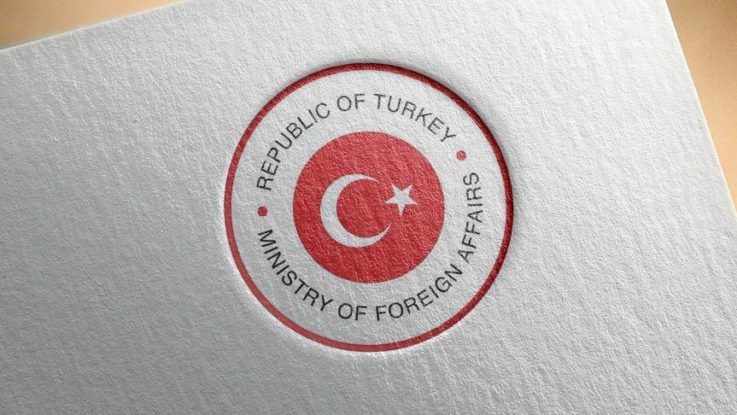 The Foreign Ministry has slammed the U.S. President Donald Trump’s statements on the 1915 events, saying it contained “misinformation and false definitions”. In a written statement on Monday evening, the ministry said: “U.S. President Trump’s written statement of April 24, 2017 regarding the 1915 events contained misinformation and false definitions, and were derived from the information pollution created over the years by some Armenian circles in the U.S. by means of propaganda methods. “We expect from the new U.S. Administration to not accredit this one-sided historical narrative of these circles which are known for their tendency to violence and hate speech, and to adopt an approach which will take into consideration the sufferings of all sides. President Donald Trump on Monday marked the annual commemoration of the 1915 events by echoing his predecessors and using the Armenian term while referring to the tragedy. “Today, we remember and honor the memory of those who suffered during the Meds Yeghern, one of the worst mass atrocities of the 20th century,” Trump said in a statement. “We must remember atrocities to prevent them from occurring again. We welcome the efforts of Turks and Armenians to acknowledge and reckon with painful history, which is a critical step toward building a foundation for a more just and tolerant future,” he added. According to Turkey, the deaths of Armenians in eastern Anatolia occurred after some sided with invading Russians and revolted against Ottoman forces. A subsequent relocation of Armenians that began in 1915 resulted in numerous casualties.